Nürnberg v Schalke is one of the biggest fan friendship games in the Bundesliga. It is a fan friendship that dates back to the 1980s and both sides wore shirts that included elements of the other team. 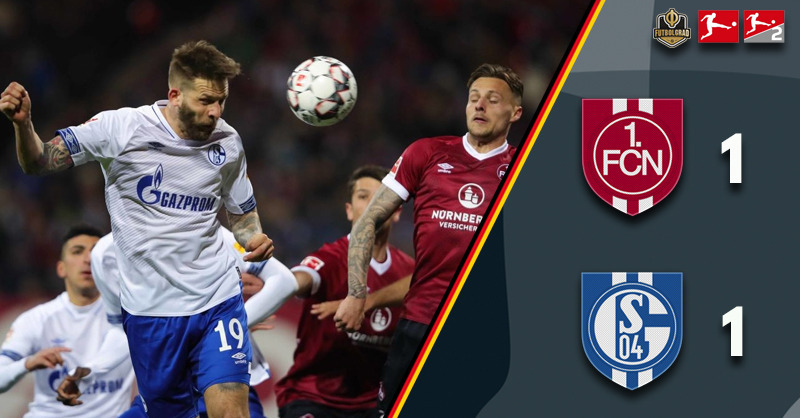 The friendship was left off the pitch, however, with Nürnberg being the more dominant side in the first ten minutes in this relegation battle. Mikael Ishak (7′) and Matheus Pereira (10′) after a corner tested Schalke keeper Alexander Nübel early. Nürnberg had 55% possession in the first 15 minutes and there was a real zip about their play in the early stages. Whenever they won the ball der Club would quickly spring forward in numbers trying to overwhelm Schalke’s backline. At the same time, Nürnberg struggled to create any further chances. Not until the 35′ minute when Ishak was brought down at the edge of the box. Eduard Löwen’s freekick, however, just about sailed over the crossbar of Nübel’s goal. Then in the 43′ minute, Nürnberg had a good goal called back. Hanno Behrens had reached the ball just a fraction of a second before Nübel got to the ball, to the surprise of anyone in the stadium referee Robert Kampka whistled the goal back for goalie interference. Replays clearly showed, however, that Nübel never had control of the ball. Nübel and Behrens were at the centre of things once again just two minutes later in the 45′ minute. First, he brought down Matheus Pereira inside the box but then stopped Behrens penalty. Schalke head coach Huub Stevens must have given his side a dressing down at halftime. Because Schalke were the more active side to start the second half but still lacked consequence in the final third. Hence, it took either side until the 65′ minute. Even though Schalke had the majority of the play at that stage it was Nürnberg to create it. Nübel had to create two great stops to keep first Ishak and then Behrens from scoring. Behrens shot, in fact, trickled through despite the keeper getting his hand on it allowing Omar Mascarell to clear the ball off the line. Finally, in the 83′ minute Nürnberg opened the scoring. Matheus Pereira was given to much room on the right and played a fantastic cross in the box where Yuya Kubo was wide open and headed the ball past Nübel for the lead. Nürnberg’s lead only lasted for a brief fraction, however. In the 84′ minute Nürnberg could not clear a corner by Schalke, allowing Sebastian Rudy to put a shot on goal that was deflected by Matija Nastasič to make it 1-1. 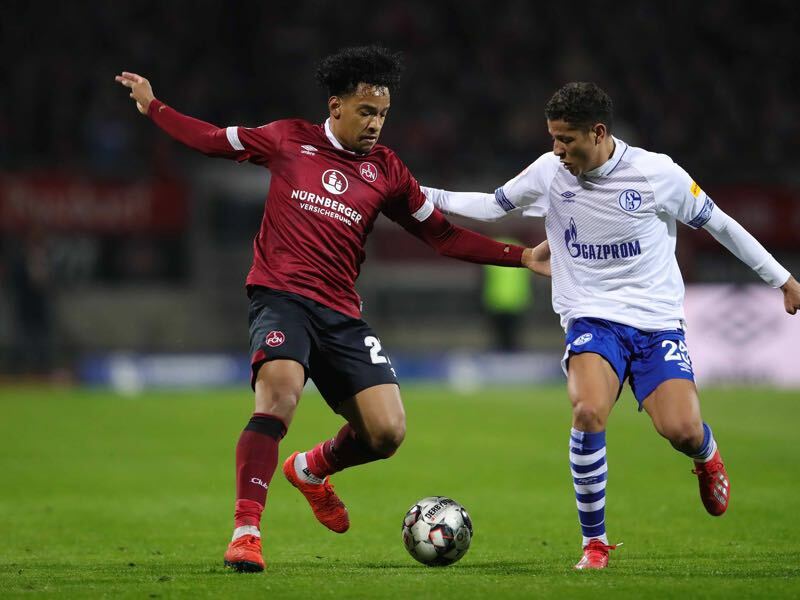 Both sides then had chances to win the game but the game ended 1-1 in what was a result that will suit Schalke more than Nürnberg. Matheus Pereira was one of the few creative players on the pitch. Not everything the 22-year-old Brazilian attempted worked out but at the same time whenever Nürnberg produced anything dangerous it was because of the forward, who is currently on loan from Sporting Lisbon. Ahead of the game, it was all about the fan friendship between the two sides. On the pitch, however, it was all about the relegation battle and both sides highlighted why they are in the bottom half of the table. Nürnberg, in particular, had countless opportunities but could not find a goal. When they finally did score Schalke right away equalised. The game, in a nutshell, showed all of Nürnberg’s problems. It also highlighted why Schalke are struggling, die Knappen had very little to offer throughout the game and were somewhat lucky with the point. Nürnberg had 52% possession and 6 to 2 shots on target. 33% of Nürnberg’s Bundesliga goals this season (8 out of 24) were scored by substitutes.